photo by Robin Jerstad for Folo Media. During the citizens to be heard portion of Monday’s San Antonio ISD board meeting, parents and students from Bonham Academy expressed concern about changes in their school. As the school prepares to reapply for its in-district charter, parent Sarah Sorensen explained, parents felt that the district has been pressuring the school to abandon the fine arts and environmental science pillars of its three-pillar charter, in favor of an expanded dual language Spanish program, similar to what the district is doing at Twain and Irving dual language academies. “This has led to the feeling of being under siege at our school,” Sorensen said. The primary concern of the Bonham parents and students is the loss of parent voice, but this also isn’t the first time that dual language curriculum has become a lightening rod during citizens to be heard. 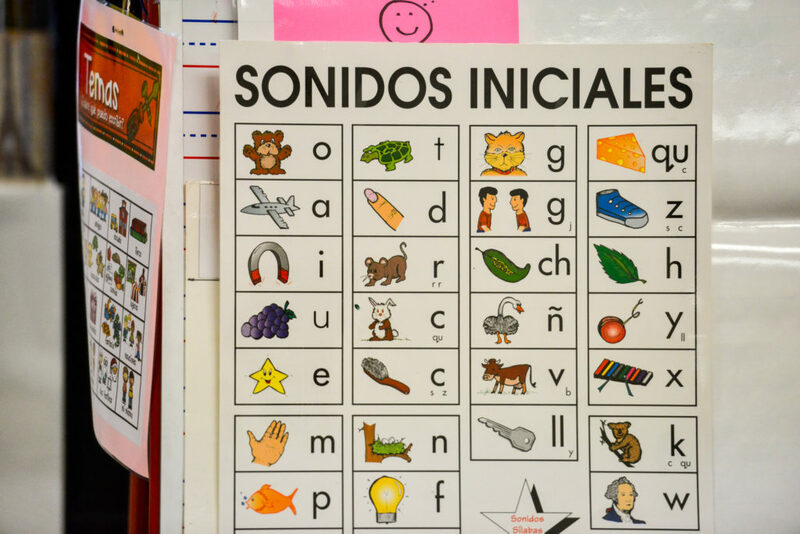 The San Antonio Alliance of Teachers and Support Personnel has raised concerns about the lack of dual language instruction in schools to be operated by nonprofit partners Relay Lab Schools and Democracy Prep Public Schools, a charter network. These programs currently use an English as a second language (ESL) program. In a district like SAISD, in which 17 percent of students are English language learners, it’s important to understand the various approaches to teaching them. And since this seems to be a point of contention in district initiatives to redesign schools, it’s also good to know what’s at stake. For generations, speaking Spanish was explicitly forbidden, even punished in public schools. Students at Lanier High School and Edgewood High School told the U.S. Civil Rights Commission that they were told their language was “dirty” when they were students in 1968. “Bilingual education for many years has been viewed as a remedial program,” Olivia Hernandez said in an interview before the board meeting. Hernandez oversees SAISD’s bilingual education. She’s also the assistant superintendent over Bonham Academy. She has spent her entire career working with English language learners in Mexico and the United States. Many adults who grew up in San Antonio probably remember having Spanish-speaking classmates who were pulled out of class for an hour or so each day, and sent to an intensive English language class. This method is called English as a second language, or ESL. When kids are taken away from their regular class for English instruction, it’s called a “pull out” program. This, Hernandez explains, is the least effective of all the methods allowed by the Texas Education Agency. Kids miss a lot of content, both when they are pulled out of class, and when they are sitting in class without understanding the teacher. They often fall behind. However, not all ESL programs are the same. “I believe that a well-implemented ESL program can serve children well,” Hernandez said. If the curriculum is content-based (it’s not like learning English for English sake, but English is incorporated into other subjects) and late exit (meaning kids have more years to work up to fluency), then it can work well for ensuring that English learners achieve at the same rate as their peers, academically. They don’t necessarily keep their Spanish. Relay uses this model at Ogden, and it has worked very well, Hernandez said. Alliance President Shelley Potter still takes issue with the model, even if the students do well academically and with English acquisition. More than one-third of Ogden students are English language learners, meaning that the Spanish language is a huge part of the community culture, and Potter says she would like to see that honored in the school. Plus, she says, if bilingualism is an asset, why not make sure these kids have that advantage? However, Ogden is climbing out of a significant hole in State accountability, and if ESL instruction can get student academics where they need to be, the district and the State are likely to encourage Relay to continue doing what works. Democracy Prep will also start out with ESL when it sets up shop at Stewart Elementary next school year. It has stated an intent to move toward a two-way dual language model, along with the rest of the district, as it can find and train the necessary staff. 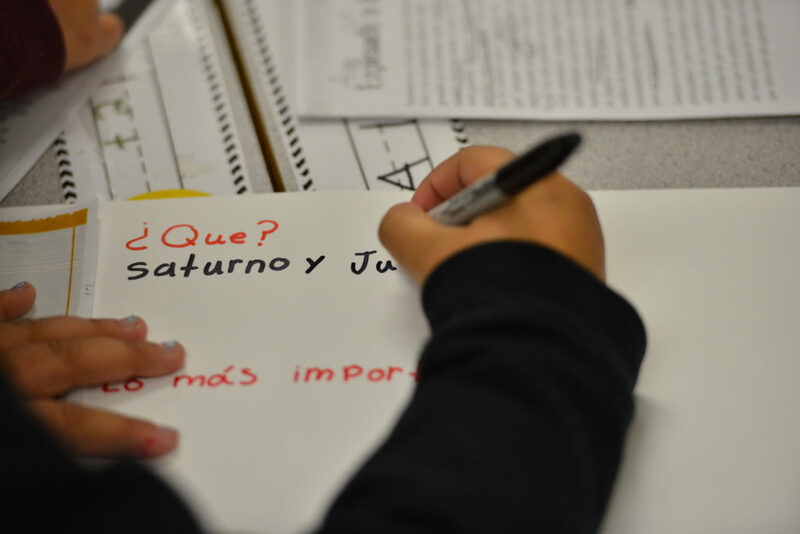 Two-way dual language instruction combines native English speakers and native Spanish speakers in one classroom. Practitioners vary in the exact proportion of how much instruction is delivered in each language, but all students are immersed in a bilingual environment. The programs typically start in pre-school or kindergarten, but, Hernandez said, if parents are prepared to work with their student, a native English speaker can join a dual language program later with success. The goal, Hernandez said, is not only bilingualism, but also biliteracy. Students should be equally comfortable learning in both languages. The cognitive and academic benefits go both ways, Hernandez said, but there’s another benefit, specifically for Spanish speakers. For students whose parents speak Spanish at home, to be allowed and encouraged to speak their native language is a huge boost in self esteem. It treats their language as an asset, not a deficit. Of course, where there are assets, there are middle class parents lining up to get them. As middle class, English-speaking families realized the cognitive benefits of second-language acquisition and the competitive advantage of speaking more than one language as an adult, dual language and immersion programs popped up in wealthy and suburban districts. In gentrifying neighborhoods dual language presented an opportunity to draw new students into the neighborhood schools. Sometimes, especially in Texas, dual language opportunities present themselves as a matter of demographics. SAISD’s dual language offerings began with Herff Elementary and Bonham Academy. It was an influx of active, largely middle class parents who advocated and organized the charter application that brought dual language to Bonham, along with arts and environmental science. However, the parents did not want to go “wall-to-wall” with dual language because, as a neighborhood school, they wanted to ensure that students who arrived in upper elementary, or students who did not thrive in a dual language environment would still be served. Three of those students—Nikolai Hussey, Andrew Treviño, and Lillian Martinez—addressed the board. As middle school students, they participate in fine arts and environmental science, but not the bilingual program. “Theater has changed my life,” Treviño said, urging the board to ensure that Bonham keeps the charter as it is. In an interview before the meeting, Hernandez said that while the district does have plans to create more dual language “hubs” for English language learners, and demand for the wall-to-wall dual language academies like Twain and Irving is significant, she is adamant that Bonham stay a neighborhood school with an English language track. “The culture for kids at Bonham is the best,” Hernandez said. The school does have the kind of active parents and community support that SAISD tried to cultivate in its schools. However, ensuring that all kids benefit equally is an area where the district could lend support. The parents know that at Bonham, the students in the dual language program tend to skew more middle class, and they tend to out-perform their low income school mates. The solution, they fear, is that the district will change Bonham’s charter, or turn the school into a specialized school, where not all neighborhood children attend, Sorensen said. Parents feel that district administration is skeptical of the fine arts and environmental science magnets, both of which parents are heavily invested in. “I hope that our fears are unfounded,” Sorensen said, but up to this point, the district has done little to reassure them.